I know that I had shared with you all the amazing (and exciting!) news that I was one of the newest contributors for Dallas Shaw on her blog. But I am pleased to announce that it's official (cause it's on the internet, right?) because all of us contributors are featured on her site! Head on over there to meet the other 5 stylish babes that are contributors! 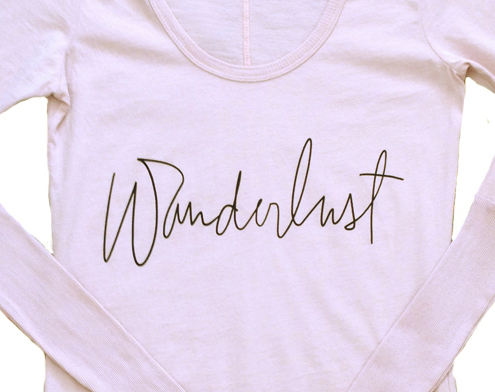 Anxiously awaiting the arrival of my Wanderlust Manifesto T! If you follow me on Instagram, you'll remember that I had met Meg Biram at the Georgetown Kate Spade event she was hosting. If you don't know about Meg, well you need to. She has several businesses going on and she makes it look effortless. All the while looking stunning. One of her business ventures is MANIFESTO T's, a product line that offers limited edition tops every month with a word that declares intentions, motives or views. She started it in January 2013 and has delivered chic styles every month. I finally got my act together and got March's manifesto, Wanderlust. I loved January's and February's manifesto, but for some reason March really got to me. I think it spoke to me because I can't really travel very much now with Cora and it makes me long for the days of being in Nice or on safari. Traveling is much more of a logistical ordeal now than it ever has been and I guess I truly am lusting after it. I don't know if in my head wearing a shirt that says Wanderlust will help me deal with my lack of traveling and seeing the world but that's why it spoke to me. Plus, it's really cute. And Part 2 of my Atlanta Girls Trip will be coming soon! I love these shirts! So cute. I really want February's sweatshirt.